This is the third in a series of simple exercises you can do to improve your trigger control. These exercises will help you become more aware of your trigger finger and better able to control its motions. No matter how fast you can draw or how dynamically you can move, you will not be prepared to defend yourself with a firearm until you can hit your target reliably. You cannot hit your target reliably until you develop good trigger control, and that’s what this series is about. IMPORTANT SAFETY NOTE! Start with an empty firearm within the confines of your safe dry fire routine. Check to be sure it is really empty, then choose a safe direction. Never “dry fire” a gun outside of your safe dry fire routine. Before beginning this or any other dry fire drill, ALWAYS check the status of your gun to be sure it is unloaded. Regardless of the gun’s loaded or unloaded status, ALWAYS follow the universal rules of gun safety while you practice. Even though a slight tremor or wobble is entirely normal, it’s still important to press the trigger as smoothly as you can. This exercise helps train you to do that. Don’t let the penny drop. Take an ordinary penny. Better yet, make sure you have a good handful of pennies within reach, because sometimes the penny will drop unexpectedly. Place the penny, flat, on top of your front sight, so it is balanced near the front of your gun. Now carefully press the trigger as smoothly as you can. Can you press the trigger past its break point without letting the penny fall? Keep practicing until you can keep the penny balanced there every time you press the trigger. You want it to stay balanced during the entire trigger press, including after the hammer falls. Now here’s something tricky: once you can do this in a very slow and deliberate manner, try speeding up your trigger press. Can you keep the penny there while pressing the trigger quickly? What stays the same? What changes? Do you find it harder to do? 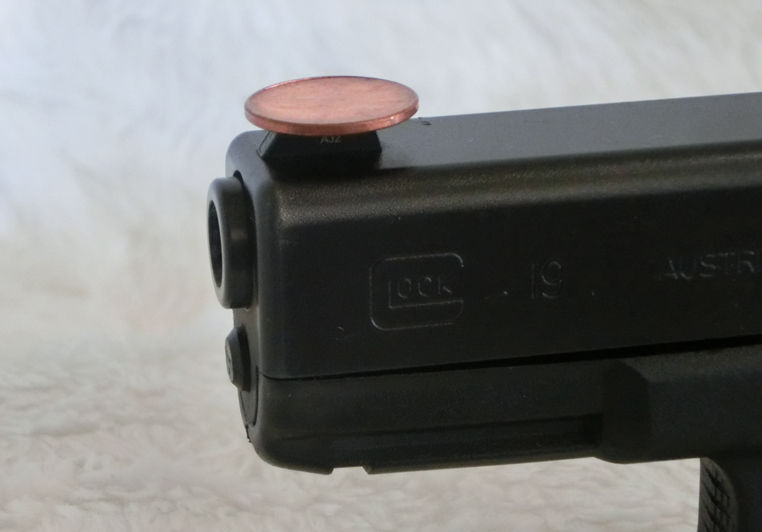 Whether you are shooting live fire or dry fire, and no matter what speed you are shooting, your trigger press should always be so smooth that it would never knock a balanced penny off your front sight.